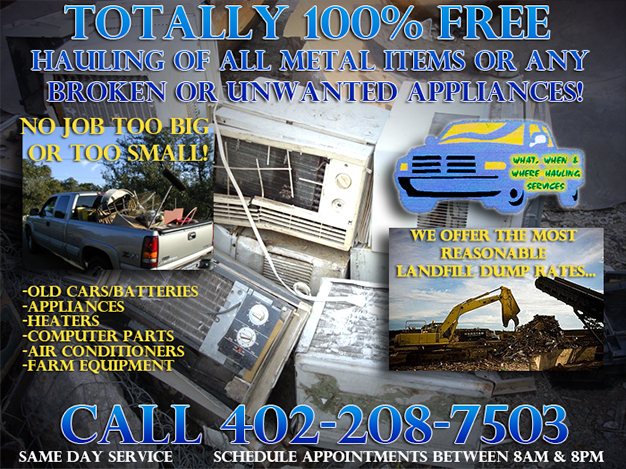 "If its in your way, We'll get it far away"
FREE scrap metal haulingand appliance removal! WhatWhenWhere Hauling Services is an Omaha-based business that provides the hauling of materials both wanted and unwanted. Services include the removal of scrap metal and large appliances from residential and commercial properties. Providing residential and commercial moving of household furniture and office materials from place to place. You tell us what, when, and where and a representative will arrive at the designated location to get the job done at a reasonable rate. Let's get the job done. "No job too big!!" Vehicle Towing- Free towing title required. Salvage Metals FREE*- Steel, Iron, Tin, Aluminum, Brass, appliances, air conditioners, furnaces, cass tubes, Copper, wire ect. I have 2 trailers sizes: 12x6 steel boxed and 16x8 flatbed ready to perform ..So give me a call and let's get the job done..
Moving- Move household and residential. Clean outs for Business and Residential 12 X 6 Dumpster Included! And lastly, the details. Check it out!